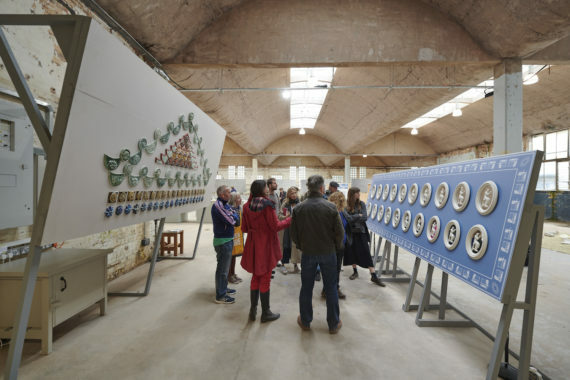 I am delighted that the opening for British Ceramics Biennial was a wonderful event and our work has been very well received. The two installations, mine and the Korean artists-in-residence’, sit very well together in parallel conversation. 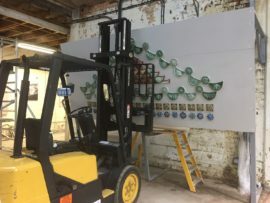 The idea (thanks to Barney Hare-Duke, artistic director of BCB) of slanting the walls they are mounted on, was a stroke of genius, as it very successfully links the two pieces together, both intimately and across the vast space of Spode Works. 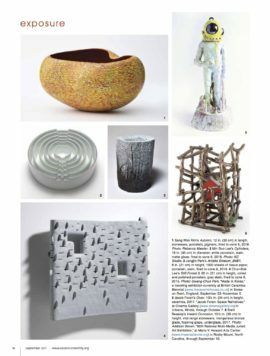 And indeed, the two pieces are in dialogue, about the ceramic making cultures of the UK (specifically the Potteries) and Korea, the handmade and the industrial, ceramic manufacturing in the studio and factory. 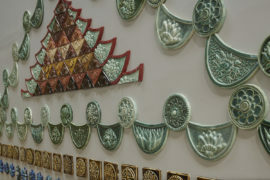 Both pieces involve repetitive labour; the Koreans’ piece was made using hand finishing techniques that would have been employed in the Wedgwood factory, which the artists chose to do rather than use a more modern process which would have made the work easier. 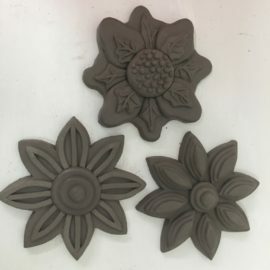 My tiles always involve repetitive casting or press moulding, and the traditional Korean roof tiles would have been made in the same way. 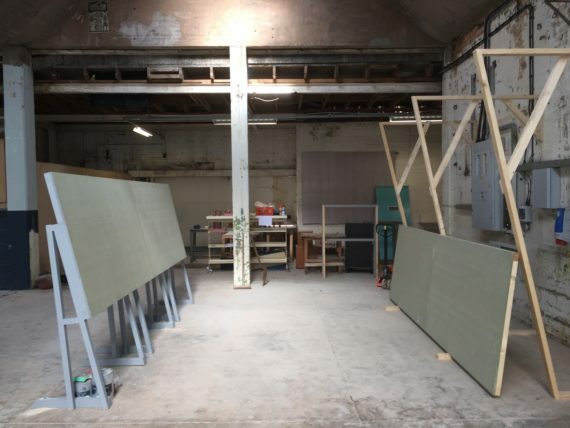 Both pieces involve mass-production (on a small scale!) 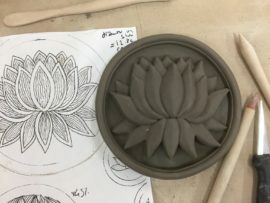 through hand-made techniques. 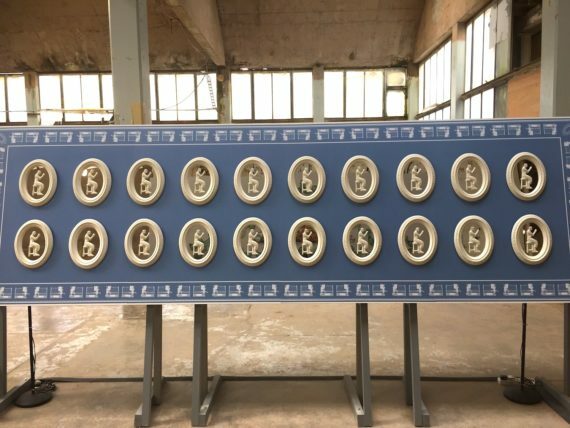 Joseph Young’s sound piece, Handmade/Automation, is a four-channel sound work which presents a sonic dialogue between two making cultures featuring field recordings from artists’ studios in Korea and ceramic production lines in Stoke-on-Trent. 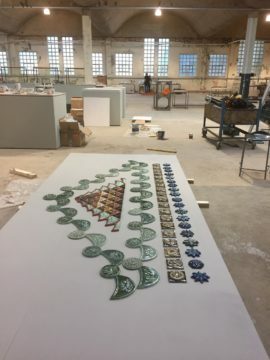 The sounds of hand-making in the Korean studios emanates from my Pavilion, and the sounds recorded in Johnson Tiles Factory come from the Korean AIRs Wedgwood piece. Joseph has carefully composed the sounds so that you stand in between the two walls and can discern the different sounds beautifully. It is a big success! Well done Joseph! It provides a beautiful, evocative soundtrack that very effectively links all the work. We are also proud of the mobile audio app, Celadonaphonic. 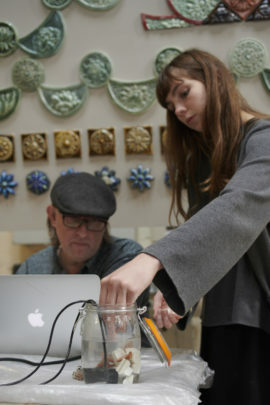 This is a GPS triggered soundwalk that accompanies the installations and is an innovative and ambitious element of the Made in Korea project where the focus is sound and ceramics. 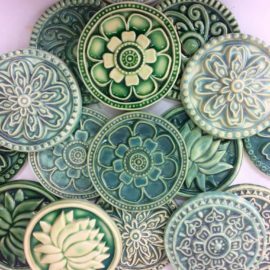 CELADONAPHONIC is a conflation of two words ‘celadon’ – a type of clay used in traditional Korean ceramics and ‘phonic’ meaning of sound. 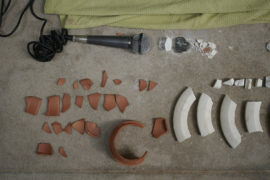 Curated by Joseph Young, and assisted by his co-curator Hankil Ryu, six sound artists (3 Korean, 3 British) have been commissioned to make new sound works about ceramics – some have used field recordings as the basis of their work, others have evolved more conceptual processes. 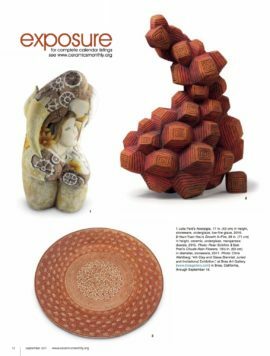 The works, taken together, explore the nature and practice of two very different making cultures. The mobile app that hosts the soundwalk can be found at echoes.xyz and is available for both iOS and Android. 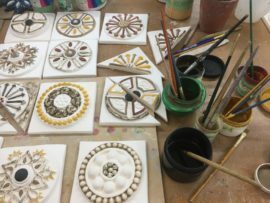 The locations are six of the BCB sites, starting at Spode Works and continuing to Emma Bridgewater and into the main hub of sites in Hanley: Airspace Gallery, the Potteries Museum, Bethesda Chapel and the Library. The sounds can be listened to remotely, from anywhere, but obviously it is best to do the trail! The sounds will automatically start playing as soon as the area is reached. 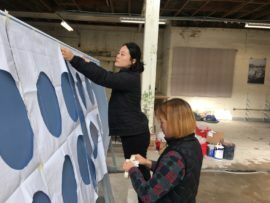 The same sounds will be sited in six sites around Mullae, in Seoul, to coincide with the culmination of the project, at Mullae Art Factory in November. 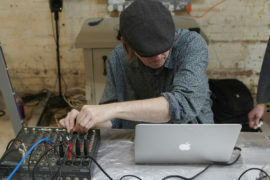 One of the sound artists on the app, Jez riley French, did a wonderful love performance of his piece ‘dissolves’ that is on the app, together with Pheobe riley Law. 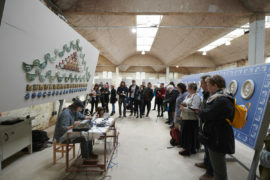 This took place at the end of the curator’s tour, when Joseph and I presented the project to the group. 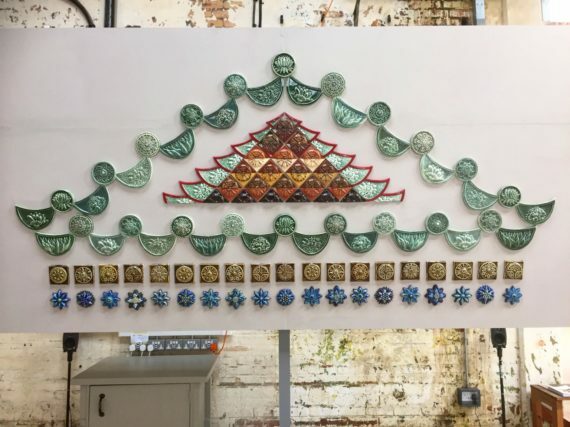 A sonic dialogue between two making cultures featuring field recordings from artists’ studios in Korea and ceramic production lines in Stoke-on-Trent. 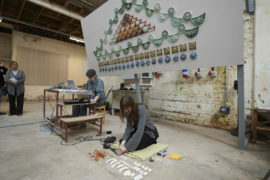 We have spent the last five days in Stoke-on-Trent installing our work for British Ceramics Biennial. 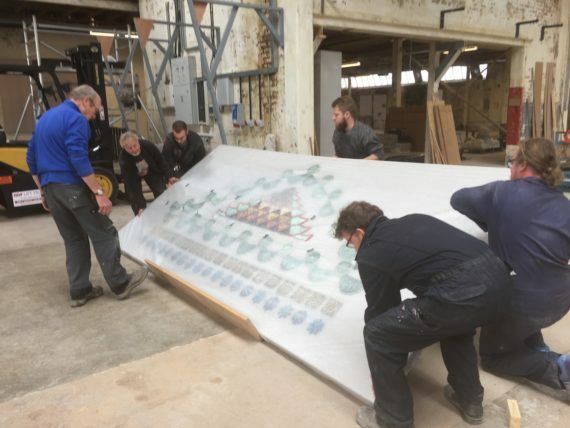 Joseph Young and I drove up from Brighton after a frenzied final week (me not Joseph, together with my studio helpers putting the hours in to make this happen – thank you both! ), arriving Saturday 16th September. This gave us a good amount of time to install, with the grand opening happening on Friday 22nd. 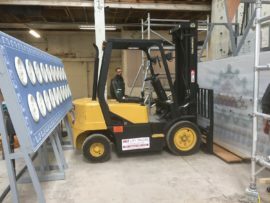 We had been informed that the work had to be ready by Wednesday morning as the press visit was scheduled for then. Now, it is Wednesday and I can revise that information! 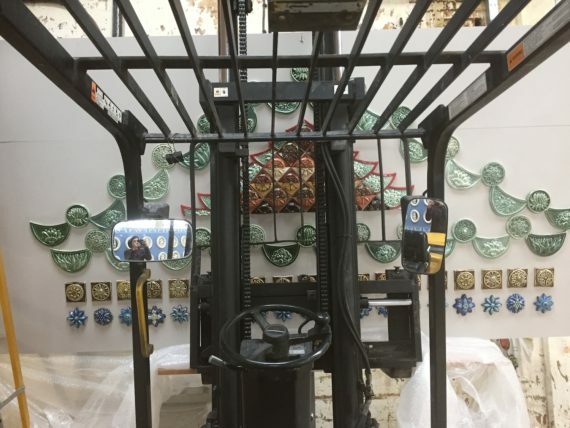 We were not ready, as were half the exhibitors, the space looked like an industrial building site filled with all manner of installation and building materials, the press did visit (early too!) and everything was fine! 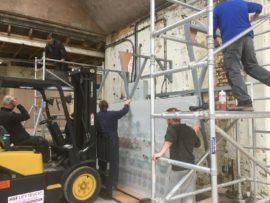 It has been the usual installation adventure – it wouldn’t be complete without a few dramas, mishaps, last minute changes and resolutions! 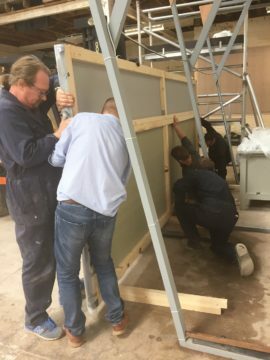 The plan that had been hatched between ourselves and Barney Hare Duke, the director, was to build two parallel walls a distance of about 4 metres apart. Mine would slant towards the viewer, the top protruding overhead, and the Koreans’ would be perpendicular, slanting back away from the viewer. 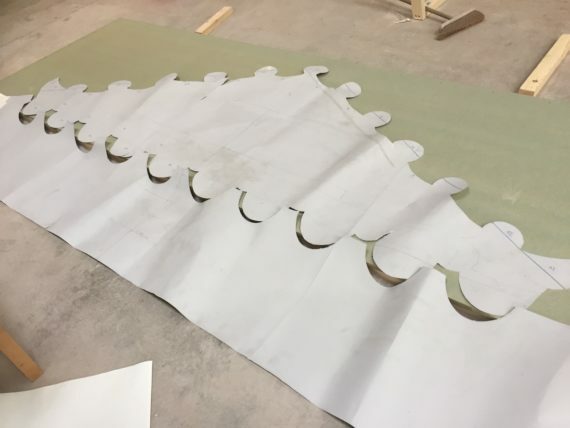 This idea came about when we were grappling with how to suggest an architectural roof shape through tiles. The overhanging structure would give the impression of a roof overhead. The parallel walls would grab the attention from across the vast space, visually linking the two walls more effectively than if they were simply upright. Sounded like it could work very well. 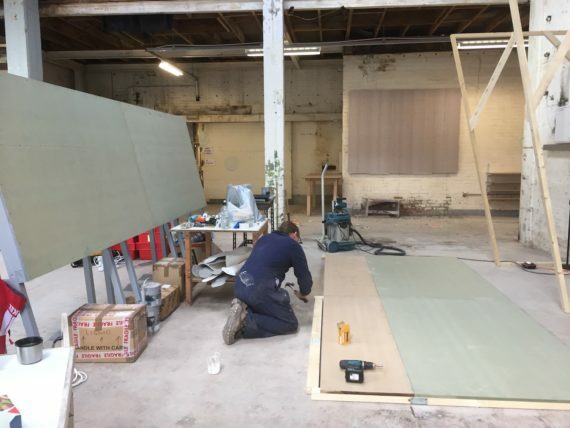 We arrived and the structures were duly in place, the Koreans’ board was up and ready for hanging the work on; mine was on the floor as it had been decided it would be easier to install the tiles flat. 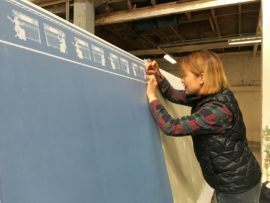 The first thing I did on Sunday morning was to lay out my template on to the board to discover that it was not big enough! 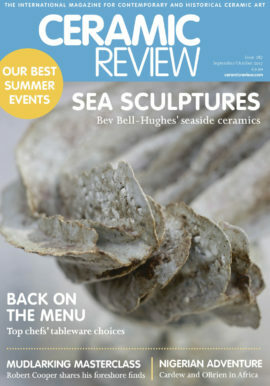 This must have been due to the fact the curators changed our site and the new dimensions were different from the old. Anyway, I didn’t need to worry for long. 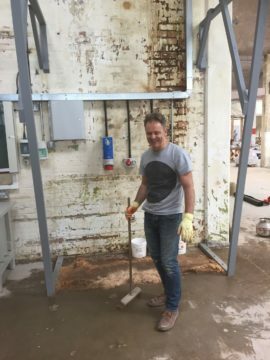 Pete, the main BCB installation guru, sorted it within an hour, adding on half a metre all along the 4m length, making it quite colossal. Would the structure be able to take the weight now? How would we get it up there? These questions remained in the background whilst I spent the rest of that day filling and painting the board. 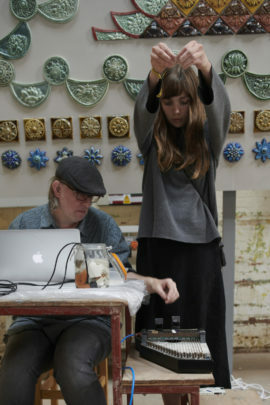 Joseph set the speakers up rudimentarily to test the sound piece in the space and it sounds really good. Kyungwon and Jin arrived on Sunday night. Won has been in Europe all summer. 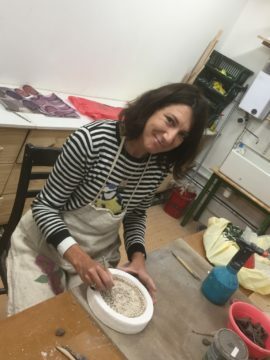 After finishing the residency at The Ceramic House, she went to do a wood firing symposium in Estonia followed by a residency in Denmark. Jin flew back from Korea especially. It’s lovely to see them again. I spent all day applying the tiles on to the board. Another last-minute change of plan had been the adhesive. I had been planning to use a new velcro-type product made by Johnson Tiles, BCB’s main sponsor. 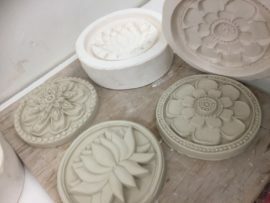 Introduced as the answer to tiling, an innovative new product that would revolutionise tiling, the first sample I tried in my studio fell off within 24 hours! 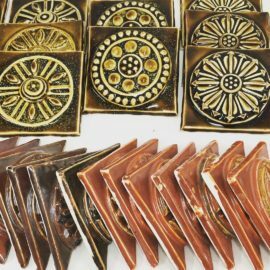 It’s not really designed for use with hand-made (read: slightly wonky) tiles. So, I plumped for an old favourite: silicon. All day I tiled, finishing by night, done. Phew. 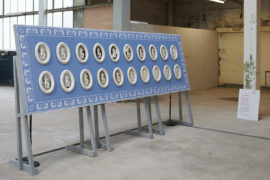 Jin and Won wallpapered their board with special wallpaper they had had designed in Seoul with a border of Wedgwood Jasperware. Next morning, fiasco. After a wet night, the rain was fairly pouring in through the roof directly on to the spot where Joseph’s speakers and computer hub was meant to be positioned. Luckily, we had predicted the weather and covered everything with plastic, but we were faced with a flood! Not only that, but some of the silicon had not gone off, and I could just twist them off. 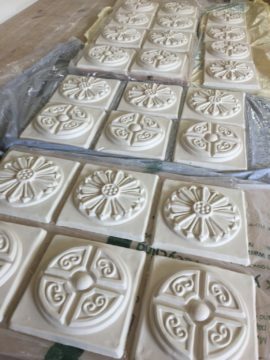 Plan B. I removed all the unstuck tiles, cut all the stuck silicon off the back, used a better, more reliable mastic and reapplied them all. Then I put drops of hot glue round edges just to make sure and spent the rest of the day trimming, sanding and repainting. Finally, it was back to where I thought it had been 24 hours before; ready to go up! Joseph finally managed to install all the cabling and set the computer up in a new, drier spot, but water continued to come through the roof all day. We had electricians in our space installing waterproof sockets (not a good sign) and the council team round looking at the roof but apparently not actually fixing the leak. 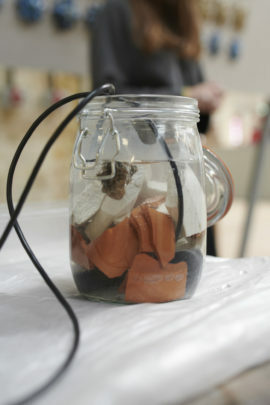 So, whether water will come in again on top of the speakers remains to be seen…! Anyway, Joseph’s piece sounds excellent and works very well in the space. 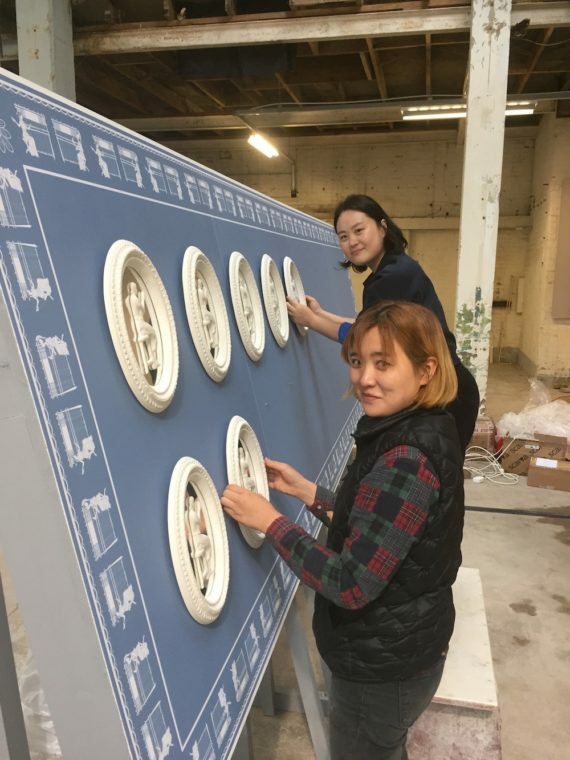 Won and Jin finished their installation, applying all their Jasperware-inspired mirror/porcelain plaques on to the wallpaper. It looks fantastic. We arrived to find the press visit were already making the rounds and had already been past our space! In any case, my board was still on the floor, covered in plastic. We had a quick word and persuaded them to bring the group back at the end. Joseph switched the sound on. 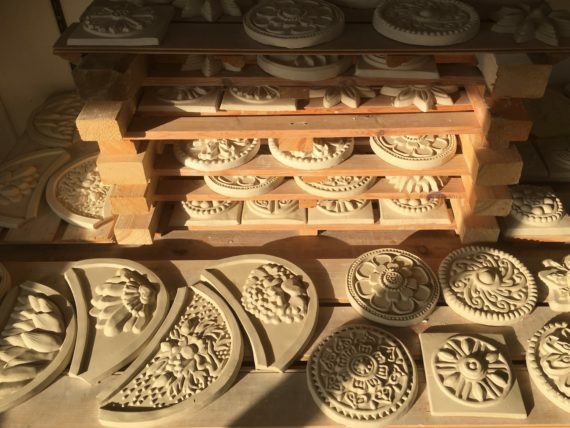 The noises of hand-making from the Seoul artists’ studios emanating from behind my Korea roof tile pavilion works very well, mixing in with the industrial sounds from Johnson Tiles Factory coming from behind the Wedgwood piece. Well done Joe! 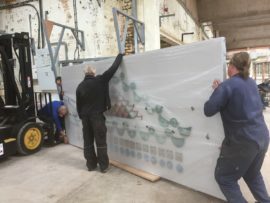 Finally, in the afternoon, a team of about ten people gathered to begin the complicated and nerve-wracking process of getting my board on the wall. 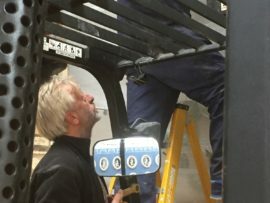 It worked like clockwork, involving many pairs of hands, several people wielding screwdrivers, clamps, huge bolts and screws and a forklift truck. Done! 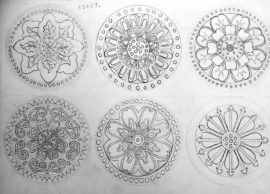 It’s been a long while since I’ve had time to blog. 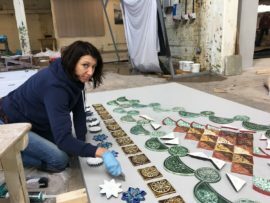 This is because I have been fully immersed making in the studio for the whole of August on my installation for British Ceramics Biennial. 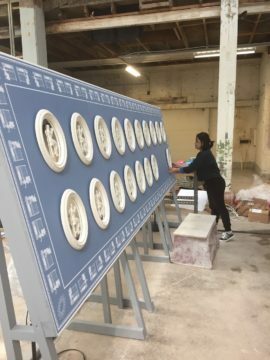 I am working on an installation for Spode Works, the wonderfully dilapidated, abandoned ceramics factory in Stoke that is now owned by Stoke-on-Trent City Council and is British Ceramics Biennial’s main venue. 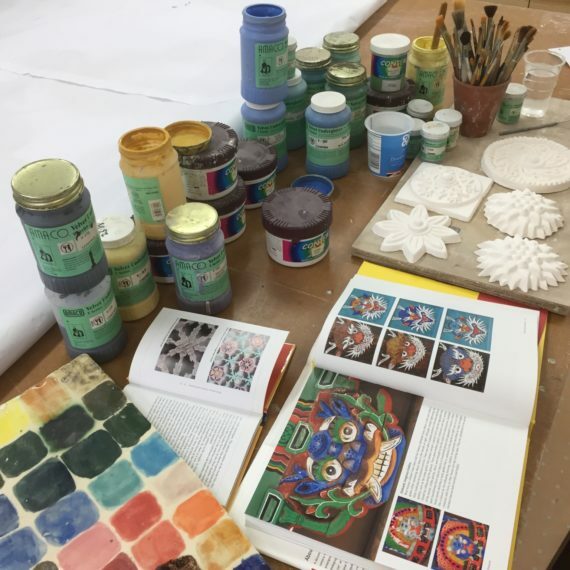 This part of the Made in Korea project involves the work made by the Korean artists in residence, Kyung Won Baek and Jin Kim, who did a residency at The Ceramic House for 7 weeks during May-June. 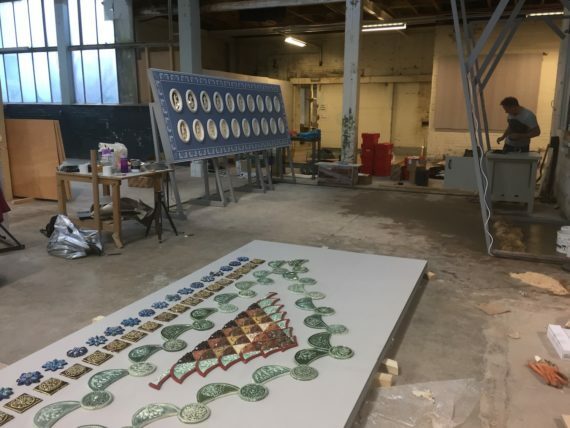 The work they created will be exhibited alongside my new work, presented in parallel, literally – two parallel wall pieces facing each other, creating an intimate installation space within Spode Works. 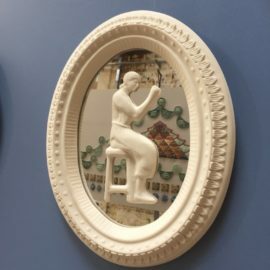 The Koreans’ work responds directly to the ceramic manufacturing traditions of Wedgwood in Stoke-on-Trent, with which they are drawing parallels with Korean manufacturing industry, in particular the female-dominated labour force and positions traditionally held by women. 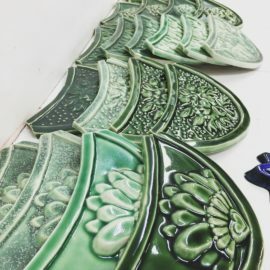 My work takes its inspiration from traditional Korean roof tiles. Whilst in Korea on my research trip last year, I visited many palaces and looked at traditional Korean architecture, and one of the defining characteristics of these pavilions is the ubiquitous presence of roof tiles, which form a functional and aesthetic purpose edging the roofs. I also learnt about them in Seoul National Museum, where there are many examples on display. 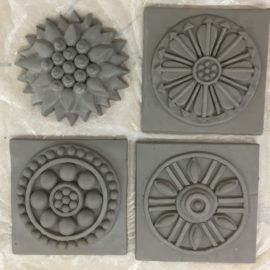 It is very fitting that I should choose this as my main point of inspiration in the creation of a piece of work that intentionally refers to Korean ceramic architectural heritage, as in my own public art practice I always aim to combine functionality with aestheticism as well as the obvious fact that they are tiles, my main artform. Serendipity indeed. 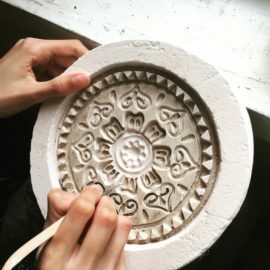 It feels like it this project was just waiting for me to discover! 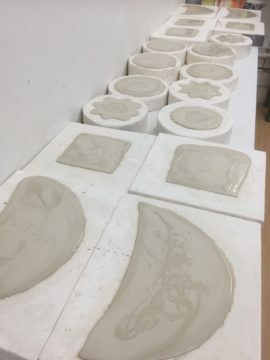 I started the making process in June and worked alongside the Korean artists in residence, but this past month has been an intensive period that has reached a crescendo in the past week with a succession of extremely late nights working past midnight to get firings on. 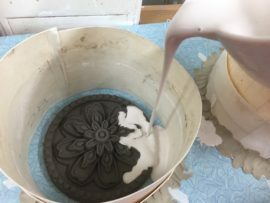 Delaying a firing by one single night could mean not enough time to remake pieces if the glaze comes out wrong, or a piece cracks, both of which have happened, of course! Timing is tight. 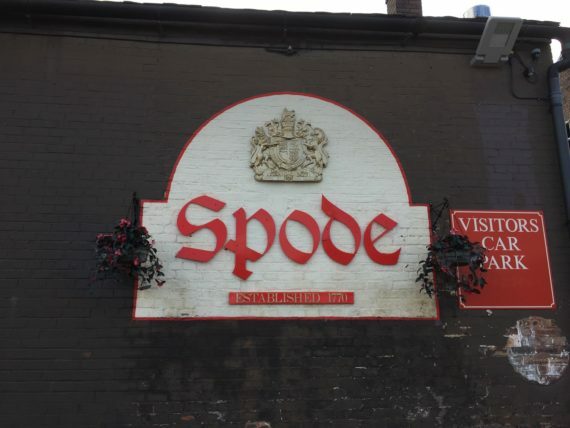 I leave for Stoke-on-Trent in 5 days! There is very little leeway for error. But on the whole, I am on track and it’s looking (tentatively) good! 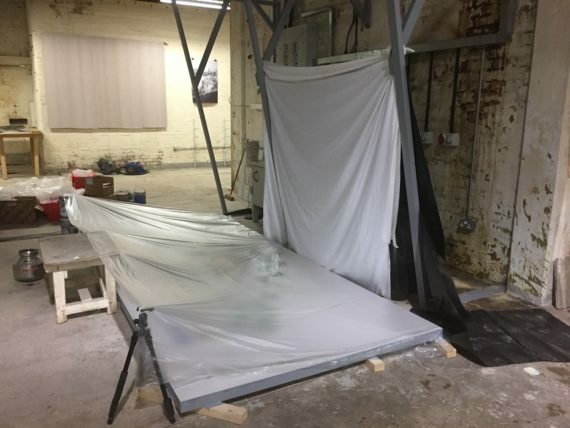 Luckily, I was able to temporarily shelve my current public art commission (aided by inflexible planners blocking my proposal on rigid planning grounds designed for building houses with no consideration for sculpture, regardless of the suitability of the proposal and relevance to the site). So, the whole commission is on hold, thankfully allowing me several months to concentrate on this. In fact, the extra time has been essential. This piece has been an adventure in the making. 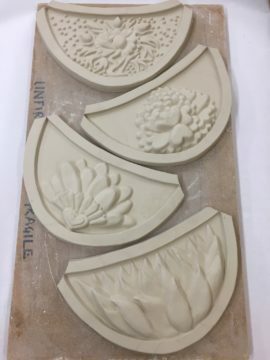 I am using porcelain and slip casting into four styles of mould that, together, will form the silhouette of a pavilion roof. The construction of the pavilion has been a long-drawn out process with much to-ing and fro-ing and u-turning of ideas. Barney, the director of BCB, has proved himself to be not only a pillar of support, but a fountain of ideas. Some of them have led me in one direction only to be transplanted. I went quite far down the route of actually employing a wood worker to make a wooden architectural structure to apply the tiles on to. It could have been effective, but realistically only with more time and a larger budget. So, back to my original silhouette roof idea inspired by traditional pavilions. 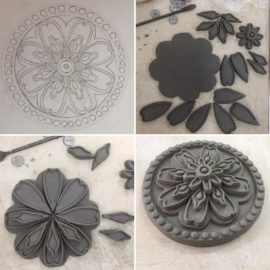 The composition is made up of my version of traditional Korean roof tiles, observing traditional geometric patterns and Korean floral designs that are traditionally found on ceramic vessels – lotus flowers, peonies, chrysanthemums and cherry blossom. 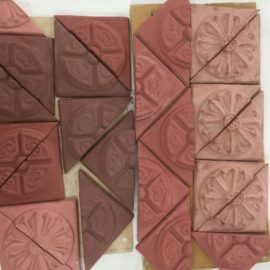 I have taken the form of the pavilion and filled it with relief ceramic tiles to describe the various components of the architecture. An edge of circular and crescent-shaped tiles gently curves down from an apex, with a triangular feature and a second row of roof tiles forming a horizontal line. 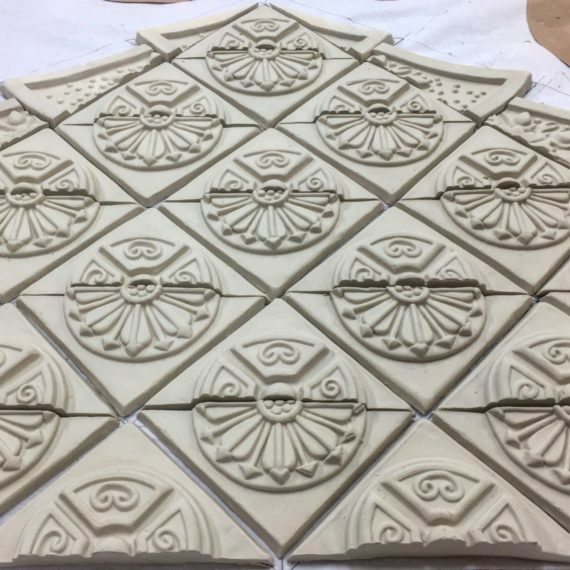 Beneath that, I have designed two more rows of tiles inspired by the ornate wooden decoration on the pavilions. 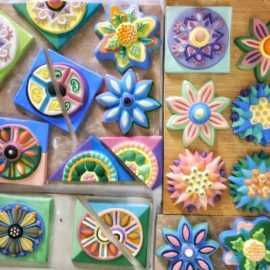 I have tested several different methods of colouring the porcelain, including colouring the clay body itself to create an encaustic effect. 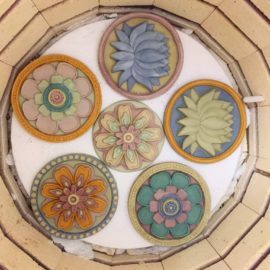 I gravitated towards my preferred use of coloured glazes with details picked out in oxides painted underneath the glaze. 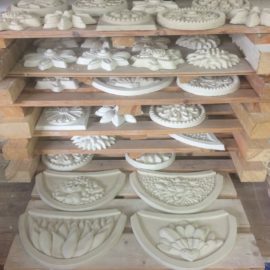 Some test firings resulted in such beautiful results, whole plans were changed to accommodate them. 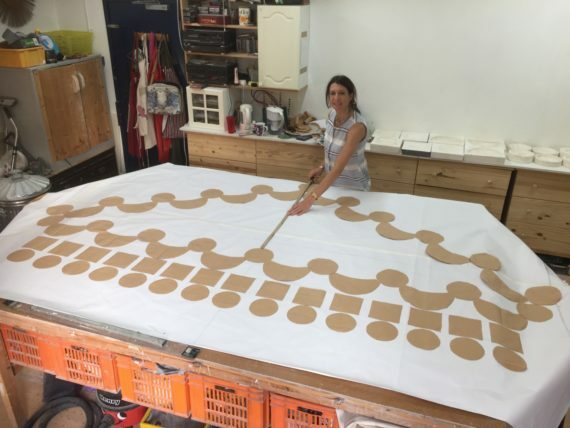 The most fortunate thing that has particularly aided this period of making is that it coincided with my first ever Erasmus student placement in the studio. 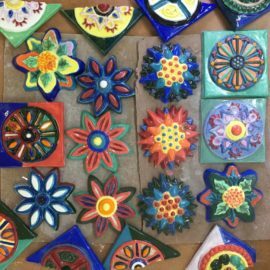 Weronika is studying a PhD in ceramics at Wroclaw, Poland, and arrived in perfect time to help on this project. 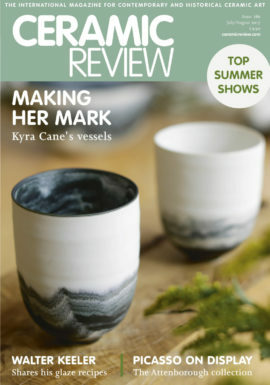 It has been a revelation having an experienced maker helping in the studio, especially on a piece as ambitious as this. 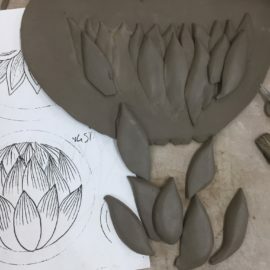 I have been working with volunteers in the studio for many years, but there is a huge difference between having to teach someone everything and being able to trust their capability and knowledge. The irony is that apparently students can no longer opt for the UK as a destination for Erasmus due to Brexit! 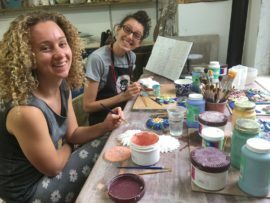 So just when I discovered a good thing… but maybe we will be lucky and the nightmare will never even happen…At the same time Izzy popped into my studio. She is about to sublet a space and offered help too and has been a huge help sanding every single piece to perfection. 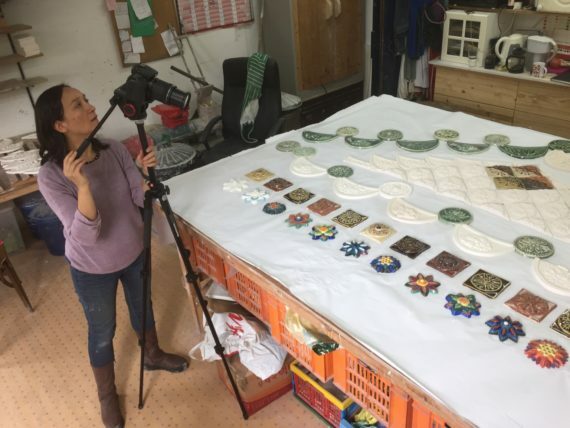 Nicki Lang from Tela Films is making a documentary about the whole Made in Korea project, and duly came back to the studio to film my making processes. 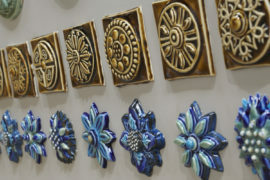 The intention is that the two wall pieces will evoke a cultural conversation between UK and Korean ceramic traditions. 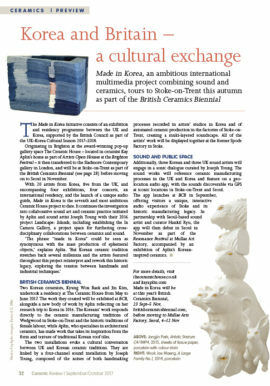 They will be linked by a four-channel sound installation by Joseph Young, composed of the sounds of hand-made clay making processes that I recorded in artists’ studios in Korea and the sounds of industrialised ceramic production that Joseph recorded in Johnson Tiles Factory in Stoke-on-Trent when we took the Korean AiRs to the site visit to Stoke. 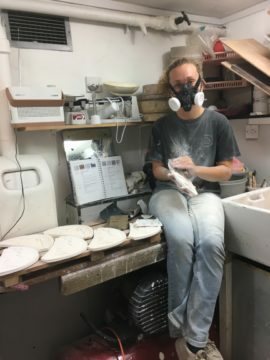 Joseph, who also has a studio at Phoenix Brighton, has been creating a multi-layered soundscape that will fill the space between the two installations, the Korean hand-making noises emanating from my Korea roof tile inspired installation, and the industrial Stoke factory sounds positioned next to the Koreans’ Wedgwood inspired piece. More about the rest of the sound components in the next post. In the meantime, I need to get this pavilion finished and ready to travel! 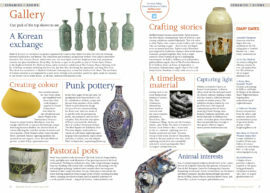 More press features in Ceramic Review and Ceramics Monthly about Made in Korea.